Check out our new website that is dedicated to spinal decompression! Spinal Decompression is a safe non-surgical, alternative approach to treating spinal related conditions specifically targeting the discs and joints of the back and neck. Spinal Decompression treats cases of disc degeneration, herniated/bulging discs, facet syndrome, and more. The preciseness of Spinal Decompression is what makes the table so effective. Spinal Decompression is designed to gently lengthen and relax the spine which creates a negative pressure allowing the internal disc material to be pulled back into its natural, healthy state. This takes pressure off of any of the surrounding pinched nerves and soft tissue that may be affected. In addition, this also allows for blood flow and nutrients to replenish the discs and expel toxins, helping the body heal itself more effectively. This innovative technology has shown to significantly reverse chronic neck and back pain. 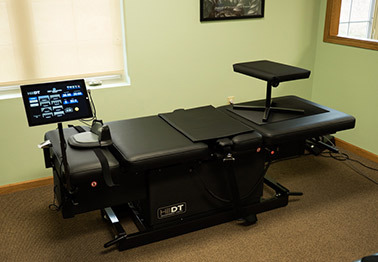 Our office uses two Spinal Decompression tables, the HillDT Spinal Decompression table and the DRX9000 Spinal Decompression table. Most of our patients have experienced remarkable results with Spinal Decompression. If you or a loved one is experiencing chronic neck or back pain, failed surgeries, or living with significant discomfort due to a lack of response from traditional approaches, Spinal Decompression should be your next option. We see results when other treatments have been unsuccessful. 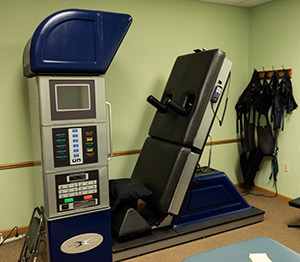 Only Spinal Rehabilitation Center of Lake Geneva offers spinal decompression in the Lake Geneva area. Our DRX9000 Pressure Relief Table .